Chris Matthews Freaks Out At Obama: "What Was He Doing?" "Tonight wasn't an MSNBC debate tonight, was it?" Chris Matthews said after the first Obama-Romney presidential debate concluded on Wednesday night. "I don't know what he was doing out there. He had his head down, he was enduring the debate rather than fighting it. Romney, on the other hand, came in with a campaign. He had a plan, he was going to dominate the time, he was going to be aggressive, he was going to push the moderator around, which he did effectively, he was going to relish the evening, enjoying it," Matthews said. "Here's my question for Obama: I know he likes saying he doesn't watch cable television but maybe he should start. Maybe he should start. I don't know how he let Romney get away with the crap he throughout tonight about Social Security," Matthews complained. 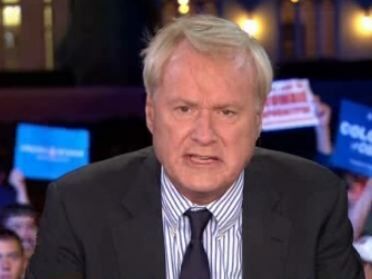 "We have our knives out," Matthews said, admitting his network is trying their best to defend Obama and his policies. "We go after the people and the facts. What was he doing tonight? He went in there disarmed." "He was like, 'Oh an hour and half? I think I can get through this thing. And I don't even look at this guy.' Whereas Romney -- I love the split-screen -- staring at Obama, addressing him like prey. He did it just right. 'I'm coming at an incumbent. I got to beat him. You've got to beat the champ and I'm going to beat him tonight. And I don't care what this guy, the moderator, whatever he thinks he is because I'm going to ignore him," Matthews said. "What was Romney doing?" Matthews asked. "He was winning." "If he does five more of these nights, forget it," Matthews added. "Obama should watch MSNBC, my last point. He will learn something every night on this show and all these shows. This stuff we're watching, it's like first grade for most of us. We know all this stuff."